TAG, TARA & TAMMY now aged 8 months. OZZIE, OLLIE & OSCAR now aged 5 months. 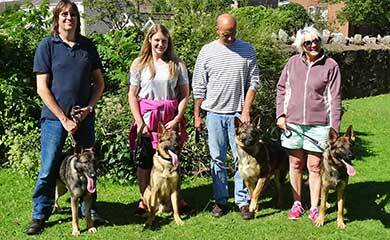 DANNO, DEVON, DIZZI, DAISY & DONNA 12 months old on 24/5/17. 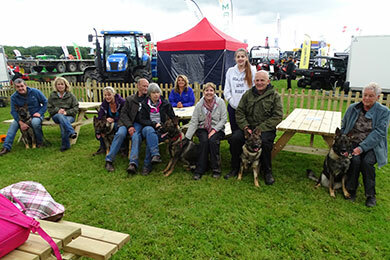 This was the fourth consecutive year that the Devon and Cornwall Operational Police dogs and our pups have taken part in the Devon County show and we all really enjoy the experience. 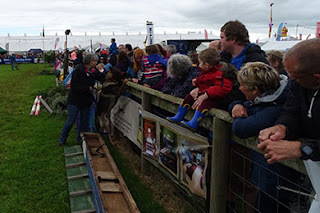 This year I split the pups into a different age groups for each day of the show as shown above. 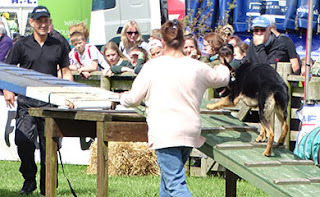 All 3 groups gave a short display which included agility on the ramps and tunnel followed by some focus work and then they met and said hello to the crowd. Riggs who are all General purpose operational Police dogs. 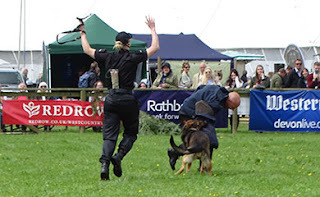 They gave a display of their skills involving control work, searching and use of force. Here is Vikki and Riggs dealing with a fleeing criminal. 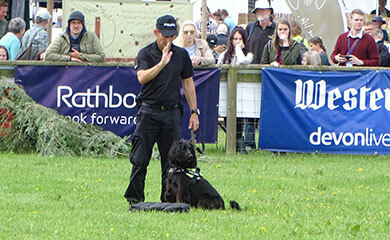 Also taking part was Steve with his Explosives detection search dog Peppa who gave an excellent display of searching for and indicating explosive substances. The whole of the display can be seen on our Facebook page. Instructor Graham Attwood did an excellent job of organising the display and provided a very entertaining commentary which was hugely popular and a great success. Here is Graham giving a briefing to a member of the public who volunteered to see if she could out run a chasing Police dog. She was convinced she was being chased by a Police dog only to discover when she reached the gate and looked around it was our mascot dog. The puppy walkers really enjoy the show and it gives me an excellent opportunity to assess how the pups cope with all of the crowds, dogs, animals, funfair, and everything else that goes on during the day. Pictured here are Tara, Tag, Tammy about to set off together for a circuit. 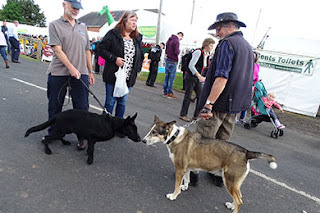 I was very proud of the dogs confidently walking through the busy crowds unfazed by anything and not showing aggression towards the many dogs they encountered. This was the case with all of the pups over the 3 days. This just shows the benefit of the puppy scheme with all the work put in by our puppy walkers to achieve this. and Tammy in particular wanted to join in with the action so we moved swiftly on. They loved the Waltzer and the Dodgems. On our travels Jill and Tara bumped into Jill’s daughter and grand daughter. 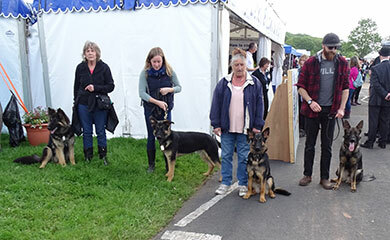 Also on our travels we bumped into Darryl and the very handsome Boris taking in the show in between the two displays. The weather was fine all day and on our coffee stop it was obvious that all the dogs had enjoyed themselves and would definitely sleep that night. Friday was the turn of my bad boys Oscar, Ozzie and Ollie. People tell me these guys look a canine version of Hells angels on the lookout for trouble. I can’t see it myself and if you see them on the video that I took they are little angels. The weather was a tale of 2 halves it was baking hot in the morning and heavy showers later on. Our first display wasn’t until 12 o’clock and with all the exciting things to see I definitely kept them out longer than I should have done. Here they are in some much needed shade. We gate crashed the dog show when the whippets were on but clearly we were a distraction and so we made our way to the fairground. At the fairground the boys were completely oblivious to the loud noise and are clearly very bold dogs. 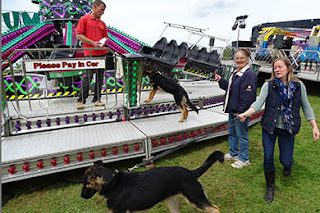 Here they are on the perimeter of the dodgem cars crashing behind them completely bomb proof. Throughout the day Bad boy Ozzie was very vocal and had plenty to say as he always does but he was on his best behaviour and was very polite to the other dogs he met. Despite a long wait before our first display the boys still put on a great performance considering how hot they were and never having appeared in front of a crowd before. The boys were a big hit in the Police stand with Ollie and Oscar pictured here engaging with the public. For such young dogs they were an absolute credit and despite the fact that I kept them out longer than I should have done I think they still enjoyed their day. Saturday was the turn of the D litter and although it was the busiest day in terms of the size of the crowds we only had to take part in 1 display whereas there were 2 displays on the Thursday and Friday. Here is Dizzy and Daisy in the thick of the action. 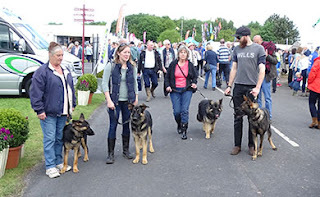 Despite having 5 dogs in the group they were all very well behaved and it was quite a sight seeing so many adult sized German shepherds moving together through such huge crowds as a group. 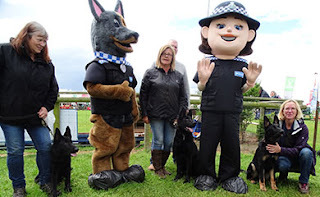 Here is Devon and Danno meeting a mascot. Here we all are stopping for a breather and to regroup. 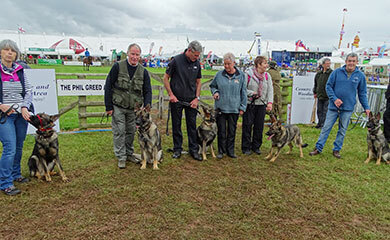 The D litter were excellent on their display in the arena and here are Danno and Devon meeting the crowd afterwards. 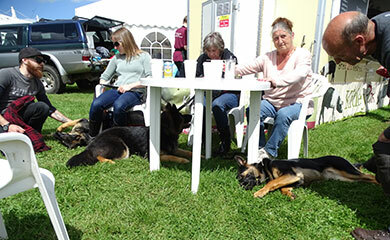 We all then retired for lunch in the Mole Valley farmers tent taking all of the dogs with us. We were very grateful to Gemma the daughter of Donna’s puppy walkers Jerry & Janet who works for Mole Valley for looking after us all. Devon and Dizzy are pictured here having a roll around together. I would like to give a special mention to puppy walker Mary with Dizzy. Mary now in her seventies has had several injuries to her leg and back during the time she has been puppy walking Dizzy but she has refused to give Dizzy up and continues to come to all of our training sessions always with her lovely cakes for everyone. 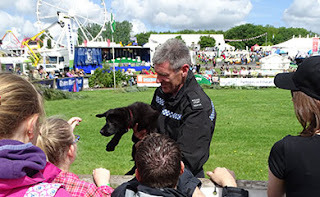 Meanwhile little 10 week old Elsa our youngest recruit who lives with me thoroughly enjoyed her time at the show. I had to be careful because she is not yet fully inoculated but there is no doubt over the 3 days she was the star of the show. Here she is with her friend Nellie an 11 week old collie that she met. 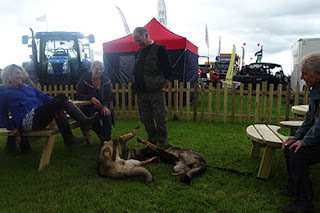 Well for me that rounded off an excellent 3 days at the show. I would like to congratulate all of my puppy walkers for the work they have all put in to prepare for the show and for giving up their time to attend. They were all a credit to our force and I was extremely proud of all of them. 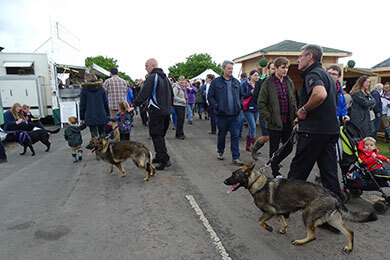 To have eleven dogs in such large crowds without any incidents and so well behaved is testament to our puppy walkers and their pups. Thanks also for your patience in putting up with me continually getting you all to pose for the camera. 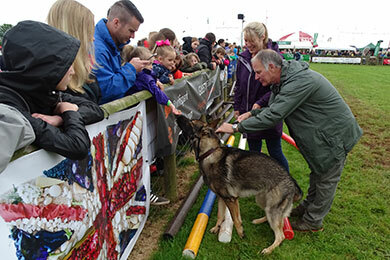 In April 2016 Comet successfully graduated as an operational Police dog but within 6 months had his operational license withdrawn because his then handler Andy and his area trainers believed he was lacking in boldness and was inconsistent his tracking performance. 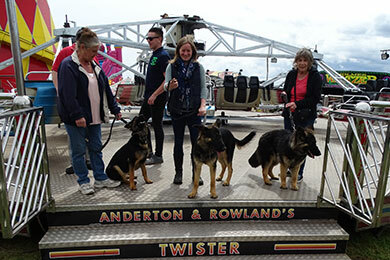 After a period of rehabilitation and allocation to a new handler Jason Gilbert I am delighted to report that this month Comet and Jason relicensed as an operational Police dog team. Here is his story. Comet was one of 7 pups in our C litter born on the 20th of May 2014. He was puppy walked by Dawn and Mark Harrison. Here he is with Dawn who he adored. For me he was probably the most rounded and most confident in the litter and performed consistently well throughout his development period with Dawn and Mark. 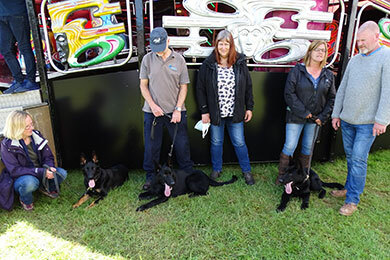 Here he is pictured with Dawn third from the right on their first training day. 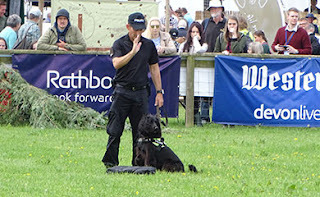 Here he is showing real determination and desire with Dawn on his introduction to criminal work. 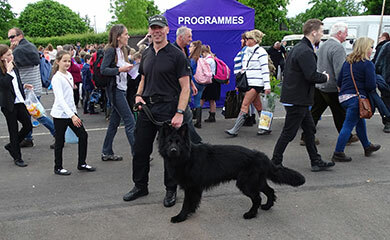 He completed his Initial Police dog course in April 2016 along with his litter mates Charley, Cosmic and Chaos. He is pictured here on the course 2nd from the right. 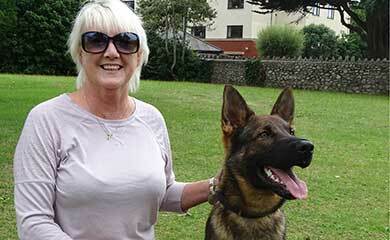 He then began his life as a Police dog in the Dorset Police force with his handler Andy. None of the 4 dogs who graduated could be described as hard tough dogs but they all had good temperaments with strong working aptitudes and were extremely willing and nice dogs to live with or be around. Here they all are in Exeter city centre on the course demonstrating a calmness and a reliability in and around members of the public. Comet is the dog on the right of the video. 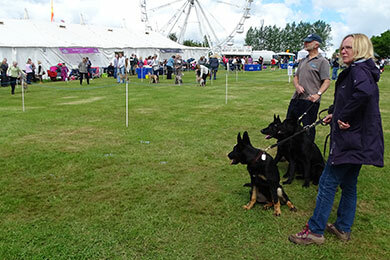 Most young dogs having completing an initial Police dog course need time to mature and develop into competent Police dogs and our C litter pups were no exception. Unfortunately Comet didn’t settle into life as a Police dog in the early months of his operational career in Dorset. 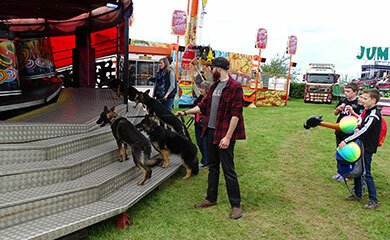 After several periods of remedial work the handler and trainer in Dorset made the decision to release him from operational duty because of a lack of boldness and inconsistency in his tracking. 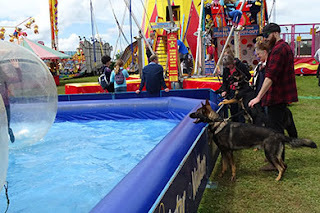 Having watched Comet being born in our house and watching him develop through his puppyhood I knew that he was a very confident and steady dog. Having also watched him perform on his boldness assessments at 12 months of age I knew that genetically he was not lacking in boldness. He had certainly never displayed a lack of boldness when he was with his puppy walkers. 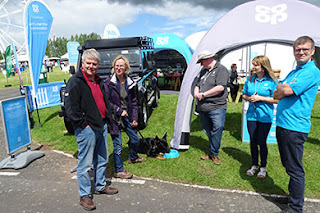 I also knew his tracking was good on the development sessions with his puppy walkers. He is pictured here tracking with Dawn in his early months. Clearly he had not performed for his handler Andy and his trainers as they would have wanted him too. But my gut feeling was that stress was in all probability the cause for his deterioration in performance and confidence. Having trained him on his Initial Police dog course my feeling was that he was a very intelligent dog but very immature in his development. 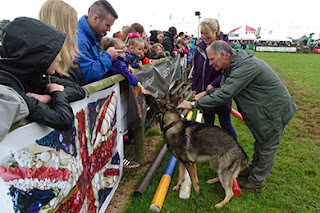 He was also handler sensitive as a lot of intelligent dogs are and was therefore a dog who needed a patient approach with lots of positive feedback from his handler and lots of reassurance and lots of play. 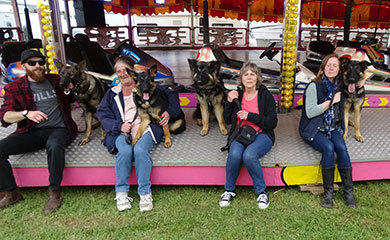 Here he is in happier times with his beloved puppy walker Dawn (far right) and his litter mates Charley, Cosmic and Chaos and their puppy walkers just before being allocated to their new handlers in January 2016. 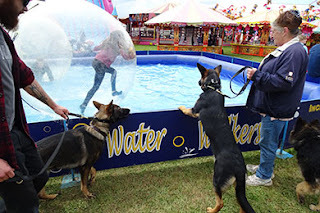 As I have done with previous dogs in similar circumstances I decided to find a puppy walker to look after him for 3 months to allow him to regain his confidence and to then reassess whether there was still a possibility of a Police career for Comet. Fortunately I had instructed Comet on his original Police dog course and also on that course were Cornwall dog Sgt James Little and the current environmental Police dog trainer for Cornwall Tim Goodwin. On hearing of Comets demise both knew of his potential and character from seeing him on the course. They also knew that Cornwall handler Jason Gilbert’s dog Sam was close to retirement and that he would soon be looking for a replacement dog. They suggested to Jason that Comet was well worth a second chance and Jason was keen to give him that chance. Jason took Comet into his home and he immediately settled in with his family and older Police dog Sam. Jason and Comet are pictured here with his Sgt James Little and his dog Cosmic on a training day during his rehabilitation period. After a number of months rehabilitation, bonding and training Jason’s supervisor Sgt James Little and area trainer Tim Goodwin were sufficiently impressed with Comet to arrange a 2 week relicensing course. At the end of the course Jason and Comet were assessed by independent Home office Police dog Instructor and assessor PC Jim Watkins from Gwent Police dog section. Comet and Jason passed with flying colours and the assessor was particularly impressed with Comets tracking performance. Jason and his developmental trainer Tim Goodwin are pictured here on the day the team successfully achieved their operational Police dog license. I have no criticism of his former handler Andy who has since graduated with another dog Reggie from our puppy program and they are doing well. Neither do I criticise his trainers because clearly Comet was not performing as he should have. I have nothing but praise for Sgt James Little and Trainer Tim Goodwin for their support to both Comet and Handler Jason Gilbert. I know Jason very well having seen his handling skills at close hand and know him to be a very patient, calm, good humoured and compassionate handler who has completely turned Comet around. I have watched the team during their Rehabilitation period I cannot praise Jason enough both for the job he has done and the standard he has achieved. It is now down to Comet to respond and if he again finds the job of being a Police dog too stressful then everyone has done everything possible to give him a second chance. Having seen the bond, communication and connection between them I am very confident that stress is very unlikely to be an issue and they will have a very good future together. Good luck to both of them. 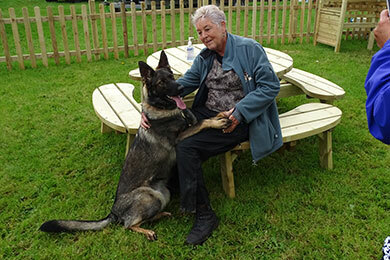 I am pleased to report that Duke has found a great new home after a huge response. 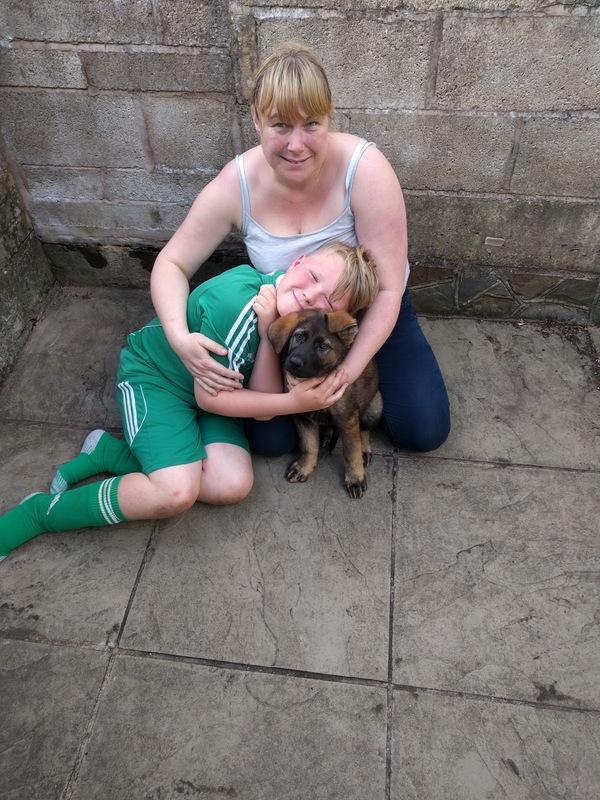 He is pictured above with his new family Kyle, Vikki and daughter Tia ‘Rose. The family visited my house a week last Friday and on seeing his reaction to their daughter Tia ‘Rose they fell in love with him. We all then travelled to their home in Plymouth and settled him into his new home. 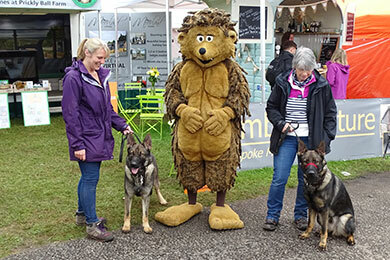 His mum Sasha and pal Rudi will miss him after his month long stay with us. I know that Duke will miss his daily romps with Rudi who is the same age as him. Duke is pictured here in our garden with mum Sasha. 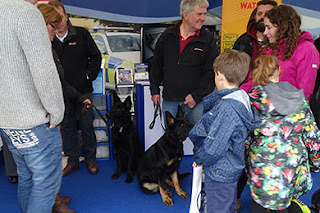 Kyle is a detective in Plymouth and his dad used to be an MOD Police dog handler before retirement which means that Kyle has good advice readily on hand. After giving Duke time to settle in I took the opportunity on Friday to spend time with Kyle and Duke to give him some advice and guidance on handling and training. 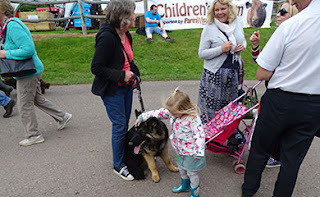 We went up to the common in Plymouth to teach Duke that on their walks he should ignore livestock and other dogs. This was achieved on a long training line and combined with play and search exercises with his tugger toy and ball. His focus to work and desire for his toy is very strong which made it very easy to achieve with almost instantaneous results. We then went to an urban estate to do some work on walking him on a loose lead and again because of his focus to play this was also easy to achieve. Kyle has ambitions one day to become a Police dog handler and I imagine working and training with Duke will no doubt help towards achieving that goal. 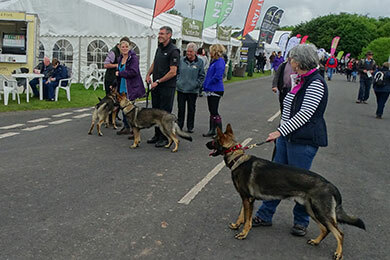 Kyle and Duke are pictured here after a very successful morning and hopefully we can do some further training sessions in the future. 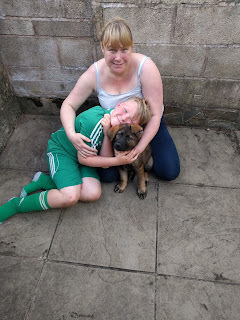 On Monday last week I travelled up to meet the breeder of Kazzardsway German shepherds Bernard Horton in Droylsden Manchester to collect from him 2 eight week old German shepherd puppies for our September 2018 Police dog course. I saw some of the other pups in the litter and I have to say they were a very fine litter of pups in terms of their confidence, character, construction and they had clearly been well reared and looked after. 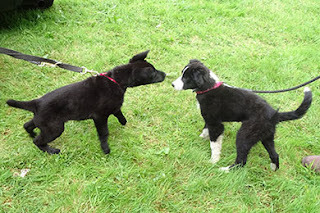 They are both very confident and playful pups and I have been very impressed with both of them. They enjoyed digging up a mole hill and playing in our garden. I then took Eric to his new puppy walkers Mark and Terri Boswell in Plymouth. Elsa will be staying with me. Both had their first night on their own and both coped extremely well with little or no crying which bodes well. Sasha has already taken Elsa under her wing and as you can see from the video she is mothering her just like she did with her own pups last year. Little Elsa has also taken a shine to Rudi but I can never leave them for a second because they are like big and mini mischief. Also Rudi is just too big and powerful and could easily accidentally injure little Elsa. On Saturday I took Elsa into Exeter city centre for a short trip. I obviously had to carry her due to her not yet being fully inoculated but nothing seemed to faze or bother her. She certainly made one old chaps day, he didn’t want to give her back. 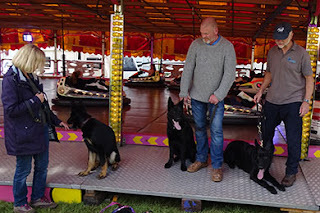 We still have to acquire 4 further pups for that course and in a fortnight I will be collecting 2 females now aged 13 weeks from Arndt Muller in Germany who are hopefully going to be part of our breeding program. 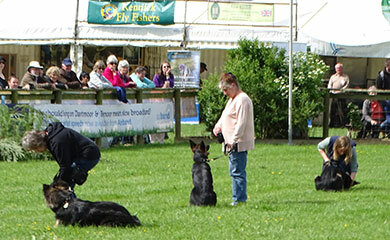 Over the last few weeks all of the pups have been practising for their appearance at this year’s Devon county show. We will be performing a short agility display and some focus work prior to the main display by the operational Police dogs. ON THURSDAY Tag, Tara and Tammy will be appearing at the show. They are pictured above after our training session last week. During the session we recorded some video of Tag doing the agility ramps and the tunnel under the supervision of mum, Marina and Seth. Tara is pictured here showing good concentration on her tracking work. Tammy, Tara and Tag are pictured here practising their sit and down work. 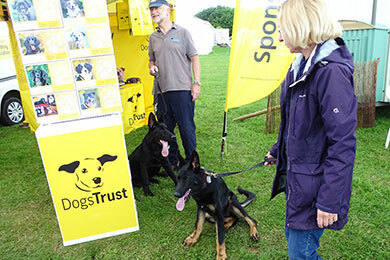 ON FRIDAY Oscar, Ozzie and Ollie pictured above will be appearing at the show. Ollie is pictured here making the ramps look easy. Oscar is pictured here showing intense concentration watching a trail being laid for him to follow. Ozzie and Ollie are pictured here doing their down work. Oscar showing lovely focus and attentiveness. 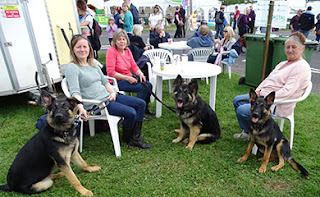 ON SATURDAY The D litter and mum Sasha will be appearing. They are pictured above on today’s training session. 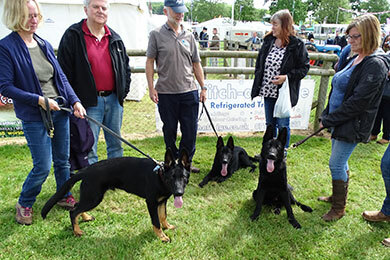 Front left to right are Donna, Dizzy, Danno and rear left to right are Devon, Daisy and mum Sasha. 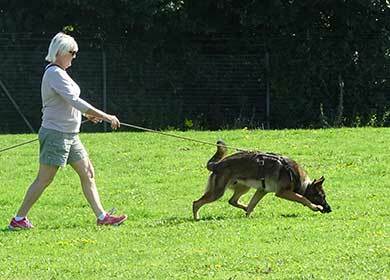 In addition to practising their agility and control work we also did our usual tracking exercises. All 5 of the group performed exceptional tracking today. They have obviously inherited this from their father Lenny. I cannot remember a group of pups that have tracked as well as these pups did today. 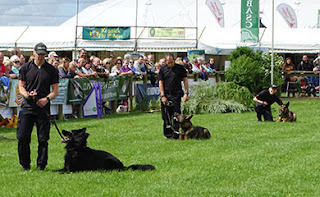 You can see the intense concentration with a low nose of Devon, Donna and Danno on their tracks today. I have included a video of Dizzy doing her track today. I could have used video of any of the pups because they were all excellent. Note the intense concentration and determination. We have been using food dropped at intervals along the track but we are now ready to introduce the toy at the end of the track which will increase the speed of the tracks. For those of you unfamiliar just what tracking is I will explain. It is getting the dog to follow the exact trail left by a person having walked across an area of ground. 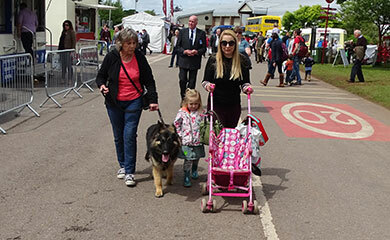 We are all looking forward to attending the Devon county show and I will compile a blog next week showing you how we all got on. From Rudi, Sasha and Elsa bye for now.